We are pleased to announce the release of HelpSmith 7.3 (which you can download from our website) that provides support for High DPI displays, adds the Zoom feature to the built-in Word Processor and Image Tool, the ability to import and split MS Word documents into topics automatically, the possibility to generate native .DOCX files, and many other enhancements. In HelpSmith 7.3, we have done a huge work to implement support for High DPI display mode which is commonly used with modern high-resolution (Ultra-HD/4K) monitors nowadays. 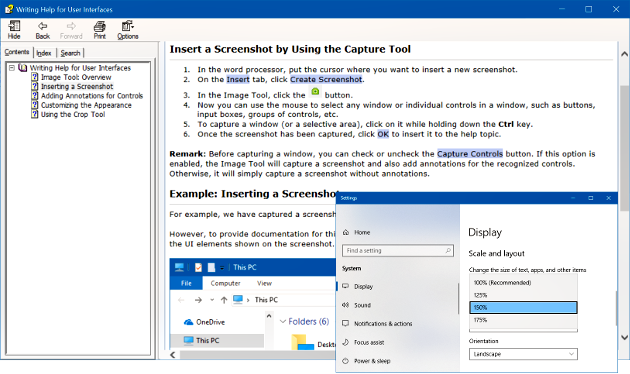 Thus, HelpSmith is now a DPI-aware application which means that its user interface is automatically scaled according to the screen resolution and scale options that you can specify in your Windows display settings. It should be pointed out that HelpSmith is also compatible for usage on a multi-monitor system where you can setup different screen resolution and scale options for each monitor. In such a case, any window including its controls, images, and fonts now also scales according to the screen settings of the monitor on which it appeared or has been moved to. In this update, we have also implemented the Zoom feature for the HelpSmith’s Word Processor and for the built-in Image Tool that you can use for quick screenshot creation and for adding annotations to user interface elements. The Zoom feature in the word processor allows you to scale the document for your convenience while editing the content of help topics. Similarly, in the Image Tool, you can now use the Zoom feature to change the scale of the image for more comfortable working. Besides from updating HelpSmith’s user interface, we have also revised the help file and documentation formats that you can produce with HelpSmith for compatibility with High DPI displays. While modern browser applications, PDF viewers, and MS Word properly display a document on any screen resolution and scale settings, there are some known issues with displaying an HTML Help (CHM) file on the High DPI mode. Despite the widely-used help formats, such as HTML Help (CHM) and Web Help (browser-based documentation) are both based on HTML which is displayed by a browser, on the screens with High DPI setting (for example, with the scale ratio 150%), the HTML Help (CHM) viewer does not properly scale images, horizontal lines, tables, paragraph indents, and document margins in case their size is specified in pixels. The new HelpSmith 7.3 update provides a solution to this HTML Help-related issue, so when you are creating a CHM help file, Web Help system, or documentation in any other format, you don’t have to worry whether you are specifying values in pixels or in any other measures – the images, tables, clickable hotspot areas (that are automatically added to your screenshot annotations), and any other objects will be properly displayed on the screens of your end-users. 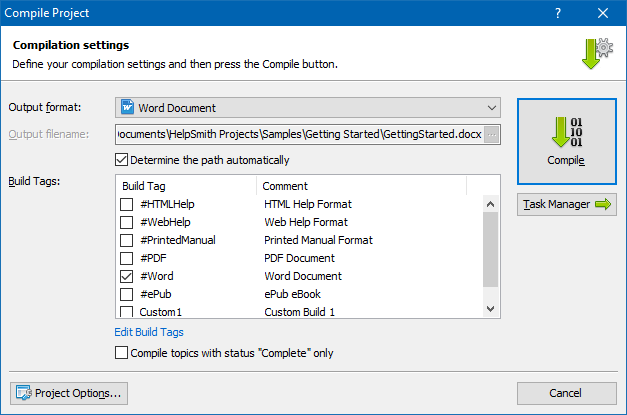 HelpSmith 7.3 provides an enhanced capability to import MS Word documents. Now HelpSmith can recognize the document’s structure (that can include chapters, sections, sub-sections, etc.) and automatically split such a document into multiple topics that will be added on the corresponding outline levels according to the original document’s structure. 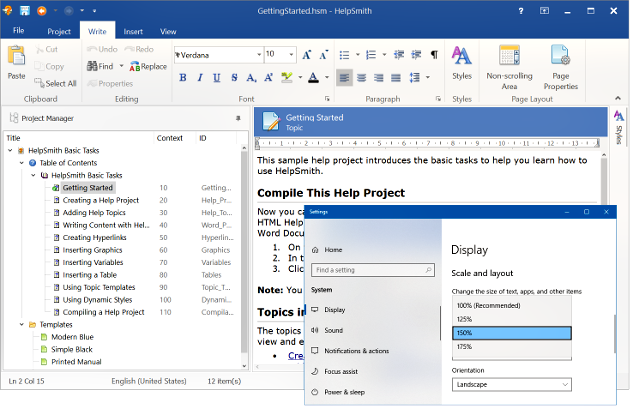 Additionally, since the structure of an MS Word document is defined by Outline Level values of the heading paragraphs, HelpSmith allows you to re-define the target outline levels during the import process. For example, by specifying custom target level values, you can import specific sub-sections into topics that will be added on a lower level; or, if necessary, you can disable one or more sub-levels, so the content of the appropriate sub-sections will be imported directly into the topics of the parent level. 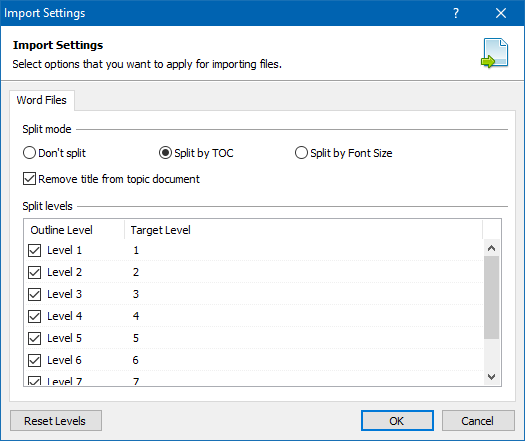 If necessary, you can also use the option to import and split a Word document into topics by specifying font size values of the heading paragraphs manually. This option was implemented in a previous HelpSmith update and is still useful in case the document that you need to import does not have a Table of Contents or specified outline levels for paragraphs. The new HelpSmith update allows you to compile an MS Word document and save it to a .DOCX file. While the previous HelpSmith versions allowed you to produce MS Word files with the .DOC extension, in fact, the file was saved using the Rich Text Format (RTF). Since HelpSmith 7.3, you can now specify any of the following file extensions for saving your Word document: .DOCX (used by modern versions of MS Word), .DOC (Word 97-2003), or .RTF (a standard format supported by most word processors). Thus, the document will be properly saved into the format corresponding to the specified file extension. When specifying a custom color for a font, background, border, or for any other object by using the Color selection dialog, you can now easily pick the color that you need from anywhere on your screen. HelpSmith is now a DPI-aware application: the user interface is scaled according to the Windows display settings (for example, on “large fonts” mode that can be used with Ultra HD/4K monitors), dialogs are also scaled when switching between monitors with different DPI-values, etc. Added the “Zoom” feature to HelpSmith’s Word Processor and Image Tool: now you can scale the document or image for comfortable working with it. HTML Help (CHM) files now properly scale images and other objects on High DPI display mode. Hotspots that are automatically created for annotations on an image are also properly scaled. Fixed an issue with creating a Word document on High DPI display mode: TOC items and other elements on a page were not aligned correctly. The values in pixels (and in other measures) that you can specify for paragraphs, images, tables, or borders are now defined using a “base” DPI value: as a result, any values will be properly scaled and displayed on a screen with a different DPI value. 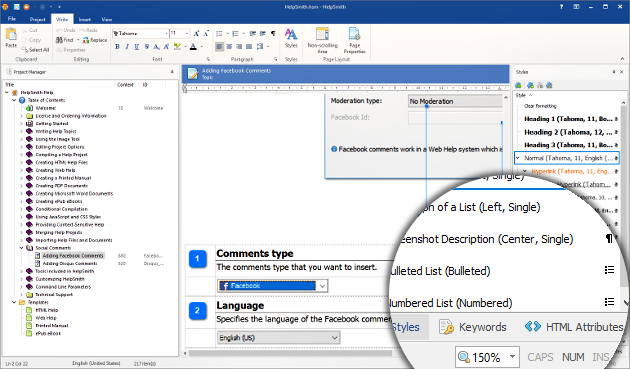 Word Import: HelpSmith can now automatically recognize and split an imported Word document into multiple topics according to the document’s structure. In addition, you can re-define the source and target outline levels during the import process. Word Import: hyperlinks to URLs containing a bookmark (#bookmark) are now properly imported. Word Import: hyperlinks added to images are now properly imported. Word Import: an incorrect hyperlink was applied to the topic’s content in some cases. Word Export: Now you can save a generated Printed Manual document in MS Word’s native .DOCX format. Previously the document could be saved in Rich Text Format (.RTF) only. Word Export: the document’s outline levels are now displayed on the Navigation Pane in MS Word (View|Navigation Pane). 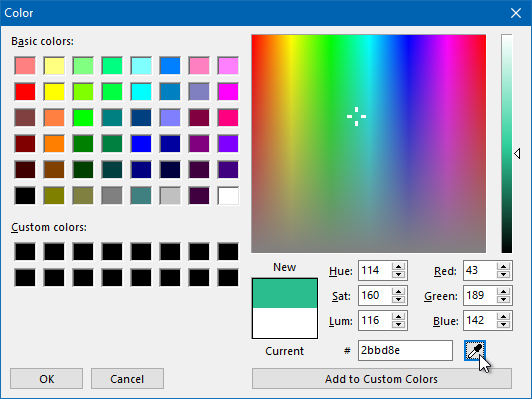 In the color selector dialog, you can now pick a color from anywhere on the screen. Added the shortcut keys to quickly change the text alignment in the word processor: Ctrl+L (Align Left), Ctrl+E (Align Center), Ctrl+R (Align Right), and Ctrl+J (Align Justify). Project Manager now displays the full path to the current help project when hovering over its title. Minor bug fix: when using the Redo command (Ctrl+Y) to restore a deleted screenshot, the document was not updated. Minor improvements related to the usage of video files in CHM help files. The HelpSmith Setup program now puts the Sample Projects to a common folder that can be accessed under other user accounts on the same computer. If necessary, you can also specify a custom folder to install the sample projects. Added the possibility to de-activate a per seat license that was mistakenly activated on a terminal server.